The New Jersey Devils finished atop the Atlantic Division standings with a record of 46-20-10, good for 108 points. The highlight of their season was a one month stretch from January 5th to February 5th in which they won 12, tied 1 and lost 1, including a 6 game winning streak and a 9 game unbeaten run. The #2 seeded Devils moved quickly through the playoffs, defeating both the Boston Bruins and Tampa Bay Lightning in five games before coming up against the Ottawa Senators, who took the Devils to a Game 7, which New Jersey won by a goal on the road to reach the finals. There, they were paired up against the Mighty Ducks of Anaheim, the surprising #7 seed from the Western Conference, who had knocked out both the #1 seeded Detroit Red Wings and #2 Dallas Stars on their way to the finals. It was the Devils third finals appearance in four years and many expected the veteran, battle-tested Devils to have an easy time over the finals debutant Mighty Ducks, who finished 13 points behind New Jersey in the standings. Game 1 saw the Devils make their intentions clear with a 3-0 blanking of the Mighty Ducks on goals by Jeff Friesen early in the second and by Grant Marshall at 5:34 of the third before Friesen sealed the game with an empty net goal in the final half minute of the game. Martin Brodeur's 5th shutout of the playoffs came on just 16 saves. Game 2 was more of the same, as Brodeur again recorded a shutout on 16 saves yet again. 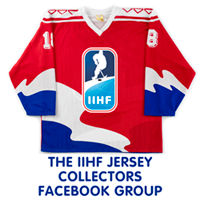 Former Mighty Duck Oleg Tverdovsky set up a pair of goals for the Devils in period two by Patrik Elias and Scott Gomez. Friesen chipped in his 8th of the playoffs 4:22 into the third to put the game out of reach for Anaheim, who headed back to California without having scored a single goal in New Jersey. New Jersey tied Game 3 at 2-2 with a goal at 9:11 of the third, but could not get the game winner before Ruslan Salei won it for the Mighty Ducks at 6:59 of overtime. Former Devil Steve Thomas spoiled Brodeur's shutout bid at 39 seconds of overtime to win Game 4 for Anaheim to even the series after four games. Jean-Sebastien Giguere's shutout came after 26 saves. Game 5 back in New Jersey was even for the first half, with each team having scored 3 goals before a video review confirmed Jay Pandolfo's goal at 9:02 of the second was not kicked in, giving the Devils a lead they would not relinquish. Jamie Langenbrunner would score a pair of third period goals to put the game out of reach at 6-3. Game 6 back in Anaheim is best remembered for Scott Stevens thunderous hit on Paul Kariya, which left him laying motionless on the ice for several minutes. To everyone's surprise, Kariya not only returned to the game, but scored a goal at 17:15 of the second period to restore the Mighty Ducks three goal cushion they gained in the first period on their way to a 5-2 win to force a deciding Game 7 back in New Jersey. 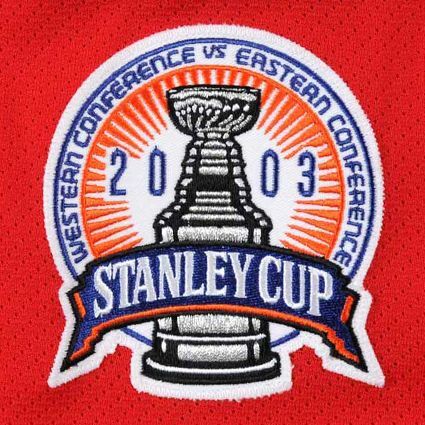 Game 7, played on this date in 2003, saw the Devils get on the board first when Mike Rupp scored the first playoff goal of his career at 2:22 of the second period. Friesen scored yet again ten minutes later to give New Jersey a two goal lead with just 20 minutes remaining in the season. While the Mighty Ducks out shot the Devils 10-6 in the third period, it was Friesen scoring his 10th goal of the playoffs at 16:16 to give the Devils a comfortable 3-0 margin. 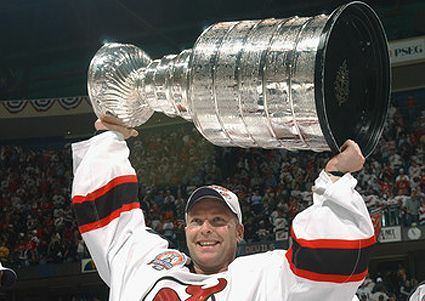 The Mighty Ducks were never able to solve Brodeur, who finished the game with 24 saves and an NHL record seventh playoff shutout of the playoffs and his third of the finals to give New Jersey their third Stanley Cup Championship in eight years. The win was the Devils 12th on home ice, also a record. Rupp's goal was the first time in Stanley Cup history that a player's first career goal be the Stanley Cup winning goal. The Devils win at home concluded only the third time in NHL history, and the first since 1965, that the home team won every game in the finals. Langenbrunner led all playoff scorers in goals with 11 and was tied for the points lead at 18 with Scott Niedermayer (2 goals, 16 assists). John Madden was close behind with 16 points and Friesen's 10 goals were one back of Langenbrunner's 11. 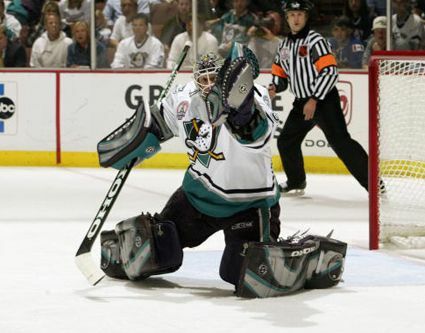 Add in the fine defensive efforts of Stevens and Niedermayer, along with Colin White and Brian Rafalski, helping Broduer to the shutout record, the candidates for the Conn Smythe Trophy were numerous, so it certainly caught many off guard when Giguere was named the winner over Broduer despite Brodeur setting the playoff shutout record and winning their head to head battle for the cup 12 goals to 18. It was only the fifth time a player on the losing team won the award since it was first handed out in 1965. 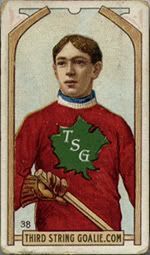 Broduer was later recognized with his first Vezina Trophy for his league leading 41 wins and 9 shutouts as well as his 2.02 goals against average and .914 save percentage. 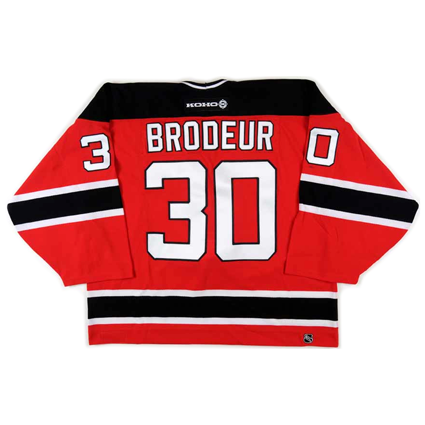 Today's featured jersey is a 2002-03 New Jersey Devils Martin Brodeur jersey as worn during the 2003 Stanley Cup Finals. 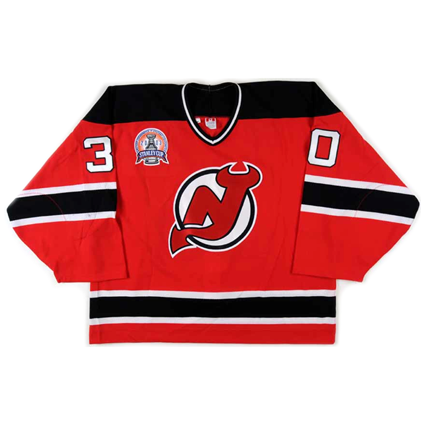 This jersey is distinguished by the 2003 Stanley Cup Finals patch worn by both the Devils and the Mighty Ducks, a tradition which began back in the 1989 finals and has continued ever since. 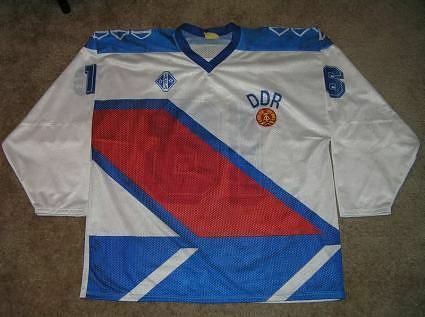 Club president and general manager Lou Lamoriello steadfastly refused to change the now classic Devils jersey. 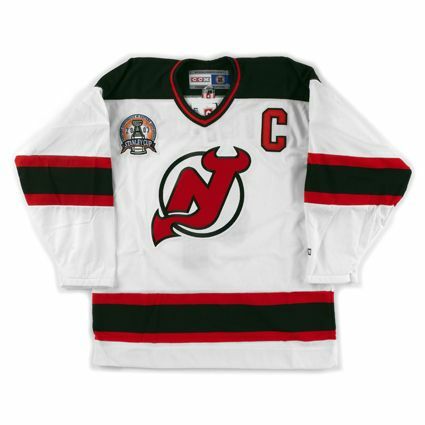 Lamoriello joined the Devils in 1987, inheriting their red and green jerseys in the process. 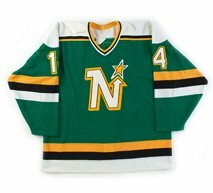 For the 1992-93 season the team changed their color scheme by changing the green to black and simplifying their jerseys striping pattern. The club has stuck with with look ever since, including the name and number fonts. 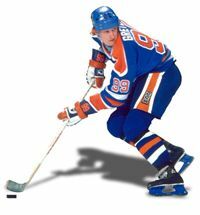 They have also refused to introduce any sort of alternate third jersey and were able to maintain their traditional sweaters even through the transition to the new Reebok Edge jerseys introduced in 2007. 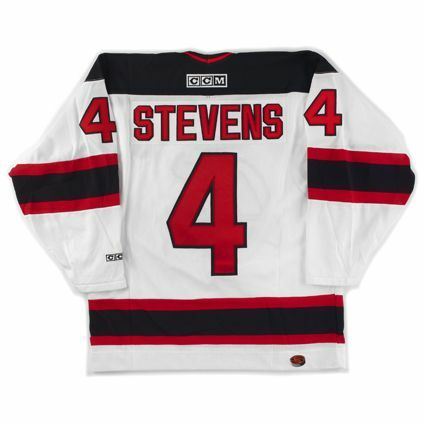 Bonus jersey: Today's bonus jersey is a 2002-03 New Jersey Devils Scott Stevens jersey. 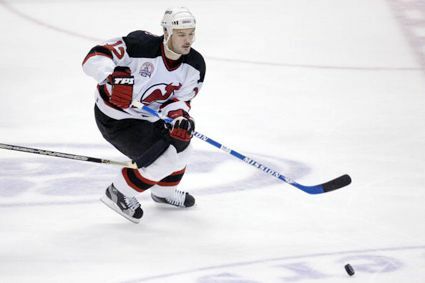 Stevens veteran leadership, legendary hard hits and solid defense was a primary reason that the Devils enjoyed such consistent success in his 12 seasons with the club. In 2006 his #4 was the first number retired by the Devils. Our video segment today begins with Stevens hit on Kariya in Game 6. 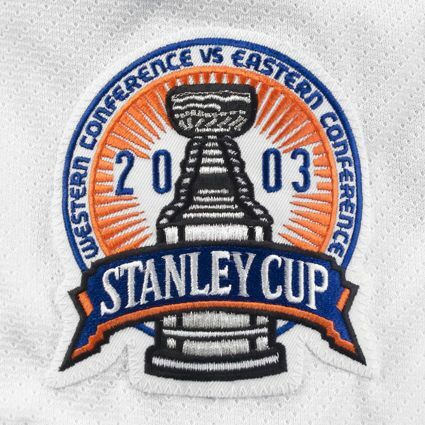 Next, highlights of Game 7 from the 2003 Stanley Cup Finals when New Jersey clinched the Stanley Cup. Finally, a montage of highlights from the entire playoffs by the CBC.